UMX Compact Size Safety Breakaway Snap-On Plain Color Lanyards - 3/4" Safety Breakaway Lanyards With Compact Size Breakaway Buckles. The 3/4" wide by 36" long heavy duty plain snap closure safety breakaway lanyards come with 13 colors available, black, royal blue, navy blue, red, dark green, orange, yellow, pink, gray, purple, burgundy and teal colors. The safety breakaway are very compact and with 300 degree swingable! This easy to carry safety lanyards are great for school students, hospital, office employees and any environment with safety required. 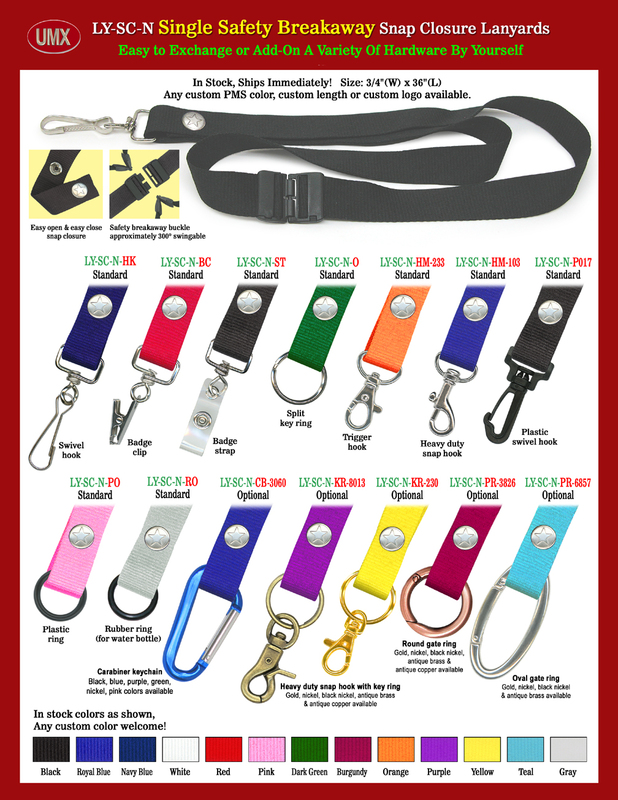 You are viewing Lanyards > Snap Closure > 3/4" Compact Size Safety Breakaway Snap-On Plain Color Lanyards - 3/4" Safety Breakaway Lanyards With Compact Size Breakaway Buckles.